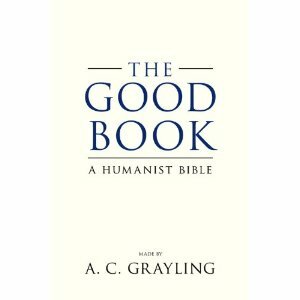 A.C. Grayling et al. is just out with The Good Book: A Humanist Bible (Amazon). It's a book supposed to replace the Bible, for those who need someone else to guide them through life. Judging by how many needs the real Bible to tell them how to behave, perhaps many ought to read this one. Or perhaps not, because after all, even those who claim to get their morals from the Bible really don't. The Ten Commandments and other guidelines say nothing of many of the moral dilemmas we often find ourselves in (human cloning), are unfailingly broken by Christians (covet not your neighbors possessions would be the very fabric of how capitalism works), contain lots of parables of supposedly good men who behave in utmost appalling manner (giving your wife and daughter to a mob so that they may "know them"), and all of the horrifying acts perpetrated on innocents by God himself (plagues on the people of Egypt, despite only the Pharao refused to let his people go). Also, shellfish are not an abomination. It is an often repeated canard that we get our morals from the Bible or from God. We all (more or less) come equipped with a sense of morality that tells us how to behave, and this sense of morality comes from our evolutionary history. Empirically, many other primates have been shown to possess morality, from which we can infer that it is not something unique to humans or to the religious. Theoretically, we have a very good understanding of why individuals should behave altruistically towards others. It is no mystery why we don't go around stealing and killing, and it is not solely because the law says so. Rather, the law says so because we all (mostly) think so. There is no law against eating shellfish - my guess it's that in the Bible because the author thought they were nasty. Grayling offer these ten to replace the original ten. And who can disagree with those? Really, tell me if you do.